Access to Classic British Welcome is easy from exit 7 of the A11 motorway (autoroute). Simply turn north (away from Le Mans) on the D338 which goes directly to Saint Saturnin. Turn left at the roundabout and you will come to CBW after 1km. If you have trouble, simply follow the long line of superb classic and sports cars ! If you have a suitable classic or sports car, you will be directed by the marshals to the main parking area within the Val de Vray centre. Otherwise, you will be directed to one of the parking areas around the centre. Please obey these directions for the benefit of everyone concerned. Classic British Welcome is an extremely popular event and traffic gradually builds throughout the day. 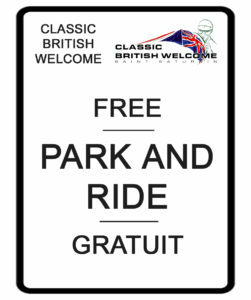 Classic British Welcome provides a Park & Ride system. It will operate all day and it is a free service for all, helping to ease congestion around the site of the event. It is based just outside Saint-Saturnin, near to the A11 motorway. From the motorway take the D338 towards Saint-Saturnin. Turn left at the first roundabout onto Rue Lucien Chaserant. Then, follow the signs for “Classic British Welcome, Park & Ride”. The Park & Ride location will be announced soon.